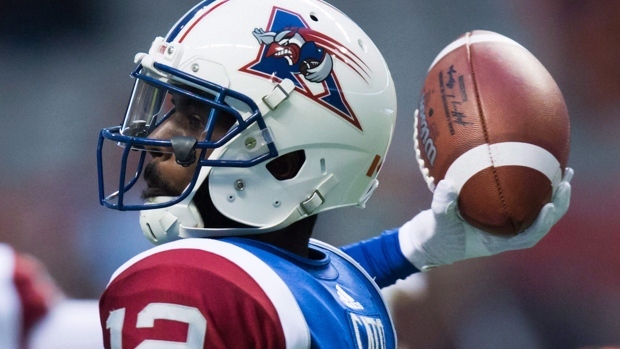 Rakeem Cato's time with the Montreal Alouettes is at an end. The move, as first reported by TSN Senior Correspondent Gary Lawless, was made official by the team Monday night. A native of Miami, Cato appeared in 18 games for the Als in 2016, throwing for 1,403 yards and eight touchdowns on 122-for-181 passing. Beginning the year as the second-string quarterback for the team, then-Als coach Jim Popp named Cato his starter during Week 12. That week at practice, Cato got into a altercation with receiver Duron Carter from which he was escorted from the practice field to alleviate the tension. Cato's release comes on the heels of the team's acquisition of Darian Durant from the Saskatchewan Roughriders last month. The Alouettes also announced they've released offensive lineman Michael Bamiro and quarterback Shane Carden.